Heart and soul S55-swapped E30 M3. Every now and again the BMW scene blows us away with something truly special and this extraordinary, S55-swapped E30 M3 – and the incredible story behind it – has done just that. Words: Elizabeth de Latour. Photos: Viktor Benyi. EPIC E30s THIS PAIR OF SPECTACULAR CLASSIC 3 SERIES BUILDS WILL BLOW YOU AWAY! When it comes to mindblowing builds you can always count on SEMA to deliver. This feels like the show that everyone absolutely pulls out all the stops for and as it’s an industry event it’s attended by some of the biggest names on the tuning scene. That means that everyone wants all eyes on them, and the way to do that is with a show-stopping build that will leaves all jaws on the floor. There are always countless stunning BMW builds at SEMA, every year without fail – all stops are pulled out, all holds are unbarred and the results are spectacular, but there’s always one build that just pushes the boat out that little bit further, that takes things absolutely to the next level, a gamechanger, something really quite unlike anything we’ve ever seen before. Last year that car was Willy Izaguirre’s utterly gorgeous Group 4 wide-body, turbo S52 E9 CSL tribute and this year, for us, it’s this, Cory Rowan’s M3, which has undergone the first E30 S55 swap anywhere in the world. Obviously engine swaps make up a huge part of the modified BMW scene and by this point just about everything has been swapped into everything else so to come across a swap that is completely new is really something special. Being the first also means that the team behind this car had no one else to follow, they had to blaze their own trail and the amount of work that’s gone into this build and the number of people involved in making it happen is simply astonishing. This is very much a build with a story at its heart, an incredible story at that, but even a project of this magnitude had to start with one person, that person being Cory. Cory is a car guy through-and- through and has owned and been involved in countless builds during his time on this planet. “Before getting into BMWs I went through 10 or so muscle cars, some hot rods and some stock restorations,” he tells us. “Around 2003 I was consumed with modifying muscle cars when a mentor invited me to Road Atlanta to watch a BMW CCA track day. I ended up taking a ride in an Alpine white S50B30-powered E30 M3; before that moment I had no idea cars could go so fast around corners or brake so hard,” he laughs. “Shortly after, I sold my Trans Am and begin building an E30 track car with a few old friends. Since then I’ve made most of my friends and business contacts through the BMW community, and I’ve built or helped build a dozen or more E30 and E36 track cars and I’ve also restored a few. My all-time favourite was an Avus blue E36 M3. It had just enough power and balance to be fun at any speed; the car was completely restored, but had a track car focus to the build,” he says. 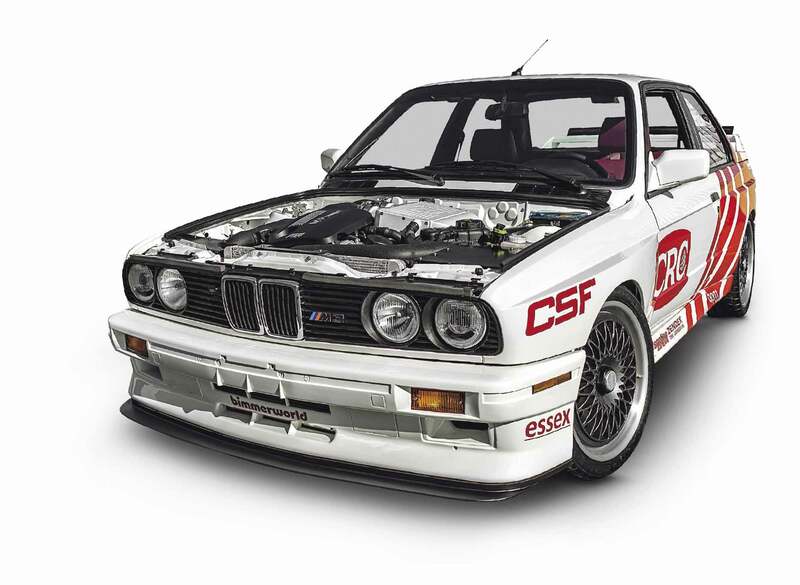 It’s clear that he is committed to the BMW cause now, as evidenced by his current collection, which includes a 1990 E30 325i (“An endurance racer I co-own with a few BMW CCA members”), a 2006 E91 325xi M Sport Touring (“The parts hauler”), a 2019 M2 Competition, and the focus of our attention today, this 1988 E30 M3. “The same BMW mentor that took me to Road Atlanta the first time, Mark, bought my current E30 M3 with his son a few years back,” says Cory. “They intended to restore it, but other priorities came up. Knowing that it was sitting, I asked for first right of refusal if it ever became for sale. A few years later I got the call and I was on a plane to get it a few days later. The car was complete, but needed a full restoration; this put it in my price range and was exactly the scope of project I wanted. The car appeared to have sat outside for a few years before the previous owner purchased it and safely stored it. There was minimal rust, but every plastic or rubber component on the car needed to be replaced. The car had a poor paint job at some point in its life – hence the full bare metal and nut/bolt restoration. “The initial plan was a simple restoration, but that quickly snowballed,” he grins and now we get into the real story of this build. “Since most of my marketing clients are automotive and some BMW-related, I thought the M3 could be the focus of a video series about friends restoring a car together in a home garage,” he says. “Restoring a mentor’s car would have been meaningful, but a better plan bubbled up. I reached out to CRC Industries, maker of Brakleen, about how to make this into something bigger. We came up with a new concept, pairing up amateur automotive enthusiasts with industry mentors. Since this was my mentor’s old car, why not use this as an opportunity to teach some younger enthusiasts? We’d give them basic resources and access to some of the most knowledgeable professionals in various automotive disciplines, then challenge them to build a SEMA-worthy car. It took almost three years to put together the team of industry partners and amateurs, six students from a local car club, and once we began, SEMA was less than 11 months away,” he says, and so began an incredible and intense build process to not just completely transform the car but to also carry out the first S55 swap in the world. Cory breaks down the entire process into five steps, and while that might not sound like a lot of work, each step alone would be worthy of an entire build under normal circumstances… “There were three cars used in the final build and they all overlapped. 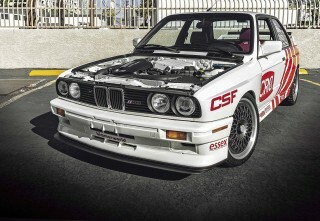 Our concept to cut build time involved combining an F80 M3’s drivetrain and electronics with our test mule, a 1985 325e. We would simultaneously carry out a body restoration on the 1988 M3 with help from mentors at Cars Remember When Restoration Center. Stage one was a complete tear-down and categorisation of every part coming off the 1988 M3. The chassis was then put on a custom dolly built by our friend Josh at Project Baja (Class 11 team) and sent to the media blaster. Body and paintwork would then happen at Cars Remember When in parallel to stages three and four. 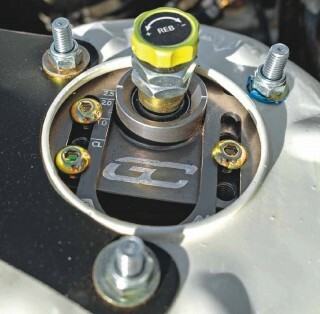 The suspension mounting points and chassis were all heavily reinforced to handle the additional power and stiff suspension from Motion Control Suspension. Stage three involved stripping a totalled F80 M3 bought from auction. We took out every mechanical and electrical component before crushing the shell. Stage four was to completely integrate the F80’s drivetrain and electrical components into the 1985 325e. This included a custom oil pan, oil pickup, relocated steering rack, firewall and transmission tunnel modifications, and custom front subframe. The final step was to migrate the entire drivetrain and chassis from the 325e to the M3 and install all trim and interior. This final step was done in three weeks of late nights and seven-day working weeks,” explains Cory and we’ve got anxiety just from reading that. This was an absolutely herculean build and it has resulted in an incredible car. While there is so much to this build it is unquestionably dominated by that engine; it’s the heart of the entire project and what makes this car so utterly spectacular. “The S55B30 engine is by far my favourite modification,” grins Cory. “We put endless hours into making the motor fit without compromising any systems. As a powerplant it has everything we could want and weighs less than the S54 or S65. Now, that doesn’t mean I don’t enjoy a nice S14-powered E30 M3, but the S55 is a pure beast. The S55 was also enticing because it hadn’t been done before and many told us it couldn’t be. So we said ‘Why not?’” and that’s the attitude that makes things happen. As Cory mentioned, the engine itself is essentially stock, because 431hp is plenty for an E30, but there are a number of custom components that have been put together to enable the engine to be installed within the E30. “The major engine modifications were for fitment. We not only lowered the engine by making a custom low-profile pan and pickup, but we moved the entire intake system down an inch,” explains Cory and this S55 has also been equipped with a CSF radiator and chargecooler. A custom exhaust was also needed and here Ouroboros Fabrication was called in to put together a suitable setup, and delivered a high-flow system finished off with a pair of very discreet twin pipes. The transmission, meanwhile, has been equipped with a diff machined for four clutches, custom ramp angles and a non-E30 3.38 final drive from Diffsonline. As Cory mentioned, the chassis has undergone significant strengthening in order to be able to cope with the massive increase in both power and torque over the standard car, definitely something that a lot of people don’t consider when they’re building a big-power E30. “The chassis was stiffened with E30 Convertible components welded onto the unibody. We also used a mixture of aftermarket and custom rear shock tower reinforcements to fortify the car for true rear coilovers,” explains Cory. “The suspension is comprised of Motion Control Suspension three-way remote dampers, Powerflex bushes and BimmerWorld components. The goal was to have a track-ready setup that would still have some street compliance. Some is the operative word here; the car is built end-to-end for track duty,” he adds with a grin. In addition to the extensive chassis upgrades, the E30 has also been treated to a brake upgrade, something of a necessity with this much performance on tap, and up front sit a pair of AP Racing Radi-CAL calipers with E36 discs and at the rear E46 brakes have been fitted. When it came to styling, there was a clear vision for this build, as Cory explains. “The car had a well-defined theme from the start: it would be a street car, with a strong tribute to DTM and Evo versions of the M3. This extends to the livery as well; several times we’ve been asked about the car’s vintage livery but it is a new design. My design partners and myself spent countless hours looking over touring car liveries from that era and considering how the lines of the car would affect the visual proportions. Our basic rules were keeping the car from being visually compact, adding movement, and keeping the livery monochrome.” The end result is fantastic and the tribute to old-school racing liveries is evident in the design while a few additions like Bosch smiley headlights, Evo grilles and kidneys and a Sport Evo front and rear splitter/spoiler combo just add that little more visual edge. The finishing touch is the wheels and the set chosen for this build is absolutely killer; “We knew from the outset that the car must have a vintage DTM theme with subtle touches that the average enthusiasts wouldn’t notice,” explains Cory. “Forgeline offered an LS3 wheel that looks very similar to the wheels run by BMW in DTM, but with slightly more modern lines. We called up Steve Schardt at Forgeline to have them create a one-off set with the flattest possible face and minimal lip. He said: ‘Interesting, most customers want the opposite these days.’ He came through big time. The wheels not only feel modern, but somehow still fit comfortably within the car’s design era. They were ordered with a custom centre-lock conversion to round out the DTM theme. 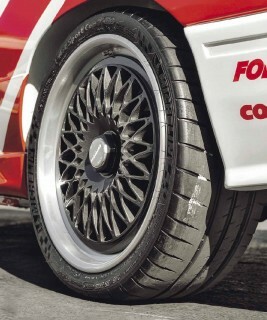 Our entire team was stunned by the quality of the wheels and centre-lock conversion components.” So not only does this E30 wear a wheel that has more than a hint of something like BBS’s iconic mag E28 about it, they’re also mounted as centre-locks, which just ramps up the cool factor above and beyond measure. While some might consider 18s too big for an E30, here the Forgelines look absolutely awesome and completely finish off the motorsport-inspired look of this M3 perfectly. What you can’t see, though, is the sheer amount of work that’s gone into this build. “The students are dedicated automotive enthusiasts, but have never tackled a build or opportunity of this scale. Mentorship from automotive professionals provided the experience and the skills needed to guide the students to a completed car. The build was also happening as graduation neared and their lives were about to drastically change. Most of the team hopes to use this build as an opportunity to launch their careers or generate support for the next build. To do so they fought late nights, school schedules, budgets, and learned hard lessons in the art of patience and perfection. The ultimate goal was to qualify for the SEMA Battle of the Builders’ Young Guns category and show that a well-built home-grown car can compete with the world’s best,” Cory tells us. After months of intense work and all night on the road from Denver to Vegas the team got the car into BotB judging with five minutes to spare and, after initially qualifying in the Top 40, they were then bumped up to Top 12. “Getting to the SEMA floor was a success for the team and their mentors, but Top 40 validated their efforts. There was no shortage of emotion when their car was announced on the big screen in SEMA’s Grand Lobby Stage,” smiles Cory. But to qualify for Top 12 the car had to be able to drive across the convention centre and onto the outdoor stage for filming and that was going to be a problem as the M3 was experiencing clutch problems and when it was repaired, an electrical issue reared its head. “Nonstop work continued through Wednesday and Thursday night. The team had been given a deadline of 9pm on Thursday by the contest organisers; 9pm rolls by and the car would only sputter. Maybe it was the words of encouragement from the other builders or that the show organisers knew how hard the team worked to get this far, but somehow they got a second chance,” says Cory. “The producer of the television show covering the contest, Bud Brutsman, extended the deadline to 8am. One more all-nighter for the team seemed to be a strange gift, but they were grateful. Reinforcements were brought in from BPM Sport (remote tuning) and BimmerSpeed (SoCal race shop) to help diagnose the issue. With an hour and a half to spare, the car drove across the carpeted SEMA floor at 6:30am on Friday,” he beams. “In 11 months the team had gone from average enthusiasts looking for junkyard parts to modify their daily drivers to being in front of 1000s of fans on television. All week, show visitors and industry icons stopped by the booth to meet the young team behind the car. The feeling when you’re mentioned in the same breath as your heroes was more than any member of the team could ask for,” says Cory. This E30 M3 really is so much more than the sum of its parts. First of all you’ve got what’s obvious, like that incredible engine swap. Then you’ve got the things that are less obvious, like all the new parts. And then there’s the stuff you can’t see, like the three years it took to source all the NLA parts from around the world. But what brings it all together, the most important part of the whole build, is the vision, drive and sheer determination of an extraordinary group of people that came together and showed the modding scene at its very best. It’s an amazing build to witness but it’s a life-changing build to be a part of and for Justin Bruch, Parker Brown, Reece Cochran, Isaac Gesundheit, Peter Golledge and lead student builder Zach Lagarenne this is something they will never forget, and it’s a build we will always remember. Custom Forgeline centre-lock 18s. Cardinal red leather has been used throughout the interior. M Tech 1 steering wheel and BMW Motorsport gear knob. S55 has been fitted with an uprated CSF chargecooler. Motion Control Suspension remote reservoir coilovers. Firewall had to be modified to allow the engine to fit. Extensive bracing has been added. Adjustable top mounts. Livery was inspired by classic touring cars.